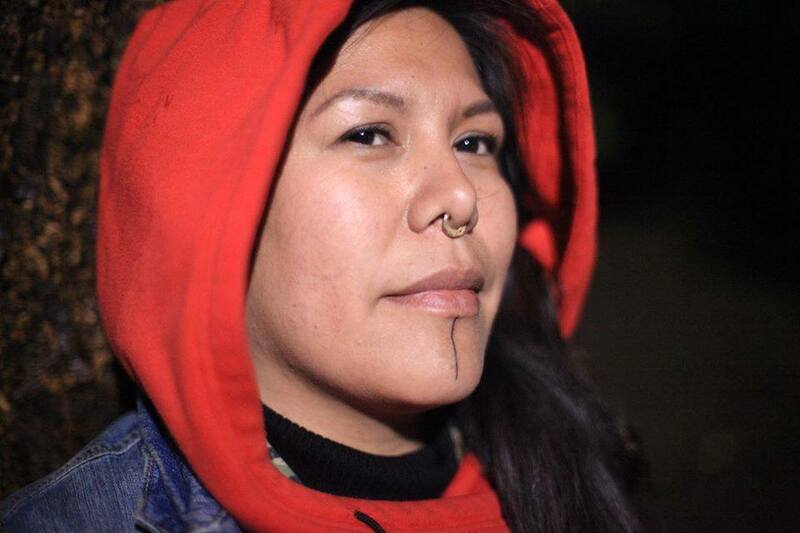 When I first met Kanahus Manuel, she was holding down an Indigenous resistance camp on a mining road in the geographical middle of British Columbia. A copper and gold mine had spilled millions of tonnes of mining waste into rivers and lakes on her traditional Secwepemc territory, and she was leading a charge to stop the mine from reopening. Over the few days I spent at the camp, Kanahus almost always had one of her four kids perched on her hip, whether she was prepping meals for long-distance visitors or standing in the path of mining trucks. I remember noticing how badass her kids were—at ease in the bush among a pretty strange crew of elders, protesters, police, mine workers and at least one reporter. Friends and family affectionately called them “freedom babies”—a term I spent quite some time over the next few months trying to fully understand. Technically speaking, it means her kids were born outside a hospital and never got a Canadian birth certificate. Easy enough to grasp. It also means her family (for the most part) doesn’t take money from the Canadian government, doesn’t rely on universal Canadian medical coverage, doesn’t enrol in Canadian schools. Whoa, right? On top of that Kanahus is on a personal mission to bring back lost culture and knowledge, starting with the way Indigenous nations bring babies into the world. I recently called her up to ask about her quest to untangle her family from Canadian society, and to “catch babies” the way her ancestors did. VICE: How did you first get into birthkeeping? Was it something you grew up with? Kanahus Manuel: One of my movement sisters, she talked about not registering her babies. She talked about having her babies free and out of the hospital. She also told me about a couple from Lil’Wat First Nation near Pemberton who were not registering their children. She was pregnant and I was also five months pregnant, and she asked me to be at her birth. Her birth was the most amazing thing—you could see the snow capped mountains and the lake, and she had a fire at the foot of her bed—it was just a beautiful birth. She wanted to have it as traditional as she could. It was a first child for both of us, and it really opened my eyes up to the belief we as Indigenous women can birth our babies of our nation and not be dependent on any other colonial type of hospital system. When you say your kids are “freedom babies”—what does that mean to you? To me it means being able to have a vision of where we want to be as native people, how we want to raise this next generation. We can’t talk about liberation if we’re continuing to birth children into the system, to colonize our own children—their birth and their education. Not registering is breaking away from these institutions. How do you even begin to untangle that? What are the challenges? People ask me, “How do you survive without the child tax?” Especially native parents who don’t have any income or low income. We just learn to survive without it. Sometimes we have to be dependent on that system to heal our family. It does become hard, especially with dental, and having to eat a portion of our food from the store. When we’re on the road especially, that’s a big issue. But the aim is always autonomy and sovereignty. We have to depend on ourselves, we can’t depend on a system. We’re going to have to find those people in our nations and movements that could provide those services for our people. What does a traditional birth ceremony look like? There’s a lot of knowledge that’s sacred, that people don’t want to share. But in general, the birth of a child is a powerful ceremony in itself. Whether you’re connected to any type of religion or spiritual way, this is powerful. And women will connect to that power in their own way. That’s their ceremony with their children. It doesn’t matter who you are or where you’re at, you’re going to feel that. I feel that by going into the hospital system you interrupt that powerful ceremony. Are there many Indigenous women out there doing the work you do? Everybody’s always having babies. There’s a demand for native birth workers to attend because of the distance away from registered midwives. The last birth I went to I actually drove 15 hours or so north to go stay there for two weeks waiting for the baby to come. Since I have four children it’s hard to get out to births. I want to raise at least my daughters in this birth world, I want them to attend births as well. We should have traditional midwives in our communities, but because of colonization and residential schools, because of all these impacts we don’t have our traditional midwives. So there’s a real push to learn ourselves as much as we can and to find those knowledge keepers all throughout our territory. We started to become those resource people for our nations, just learning as much as we can, sharing skills at workshops, bringing people in to teach about birthing practices—that’s going to start bringing the conversation back. Have you ever run into challenges or complications? There’s never been any type of complications with our births. But the reality is we do need to prepare. There’s continuous training. A baby’s life is dependent on you… Midwives have the trust of the nation that you can bring our babies into this world unharmed, healthy and strong. Indigenous people believe so much in our ways, our songs, our medicines, they’ll will their babies into existence. Sometimes there’s nothing you can do, sometimes things are just meant to to be the way they are meant to be. What kind of learning and teaching have you done? We went down to Belize, to train with the Mopan Mayan midwives. The Indigenous people there have tons of knowledge, they’ve each birthed 400, 500 babies. One is coming up in a couple weeks to do workshops on womb massage and a few different things. They also use sweat lodge in a lot of their birthing practices—pre and post-natal. There are things that I know we did here, too. Whenever I go into any other community I always ask: are there traditional midwives practicing? That’s something really important because there’s so much knowledge out there. That’s what I want to do in our own language, is find out what the name is—woman’s doctor, woman’s healer—whatever it is in our language so we can start to revive that in our nations. I think we’ll see a difference by this next generation of babies being born through midwives at home. I already see a difference in my own daughter right here.